Dog Collars Chicagoland IL, Cute Dog Leashes Lake Michigan | All Things Woof Meow, Too Inc. 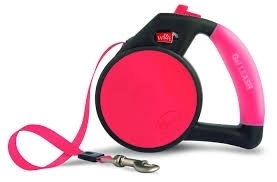 The Wigzi Reflective Gel Leash has a handle filled with liquid gel which conforms to your hand for ultimate comfort. It also allows you and your pet to be seen at night due to the awesomely bright reflective panels and tape. You'll also enjoy smooth retraction and easy to use buttons to control your dog. The Reflective Gel Leash is made with the highest quality parts and will last for years. Inside each leash is a stainless steel spring that won't rust and will keep retracting for years. Our stainless steel springs can cycle back and forth over 70,000 times. You can trust Wigzi's quality and brand reputation for years to come. Tape leads are standard. 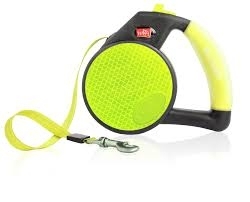 Available in Yellow in 16"
The Gel Leash is made with the highest quality parts. Inside each leash is a stainless steel spring that won't rust and will keep retracting for years. Our stainless steel springs can cycle back and forth over 70,000 times. You can trust Wigzi's quality and brand reputation for years to come. Tape leads are standard.